Live Creating Yourself. : Note to Self: Remember this for when you move to Brooklyn. Note to Self: Remember this for when you move to Brooklyn. When all that turns up are cramped, dimly-lit, depressing living quarters in my regular New York apartment Craigslist searches, it can really do a number on one's spirits. But this breath of fresh air apartment proves there really is hope! It just takes a bit of decorating magic. 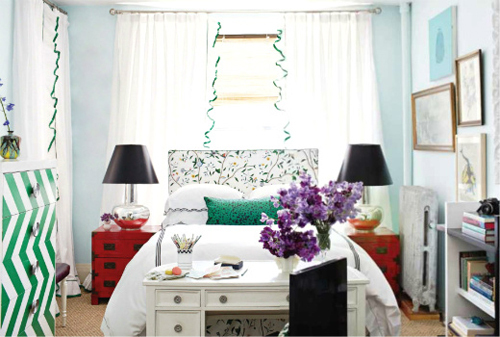 Bright colors, small-scaled yet dramatic furniture pieces, and creative use of space allowed designer Nick Olson to transform this 300 sq foot Brooklyn studio into a beautiful, livable home. 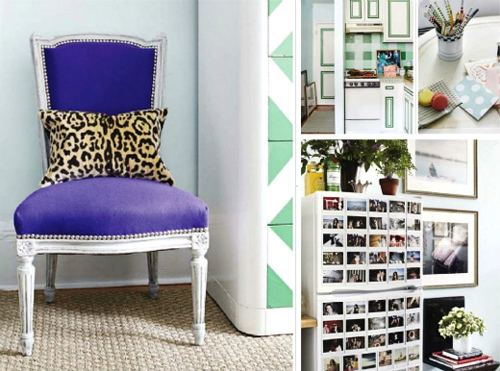 I love every detail from the purple chair to the green-trimmed drapes to the photo-smothered refrigerator. What a cozy place to call home. To take a video tour of the home, click here. my apartment in italy is so tiny and all i do is search for small space decorating ideas, but THIS one takes the cake! thanks! 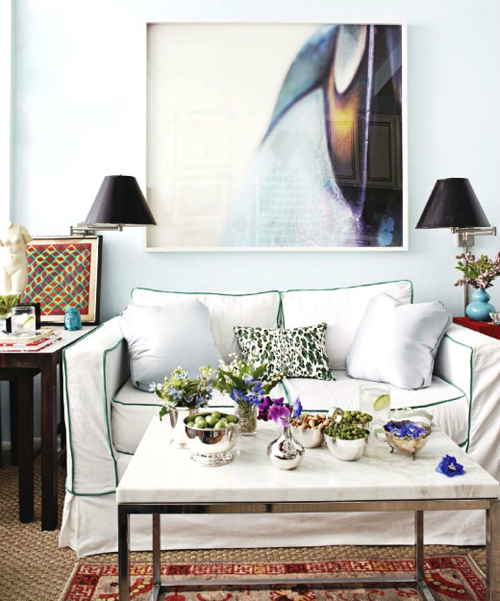 This color palette is so refreshing! 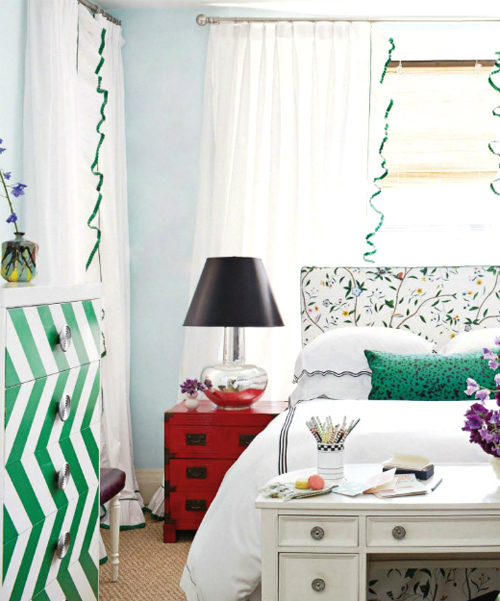 Love the green with pops of color. I ADORE this home, I actually saved it form my Link post on Friday!! Oh wow. I love it! 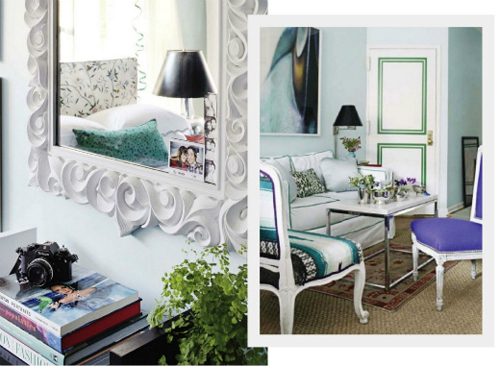 The color palette is so refreshing and inspiring. I love all of the little eclectic details too! 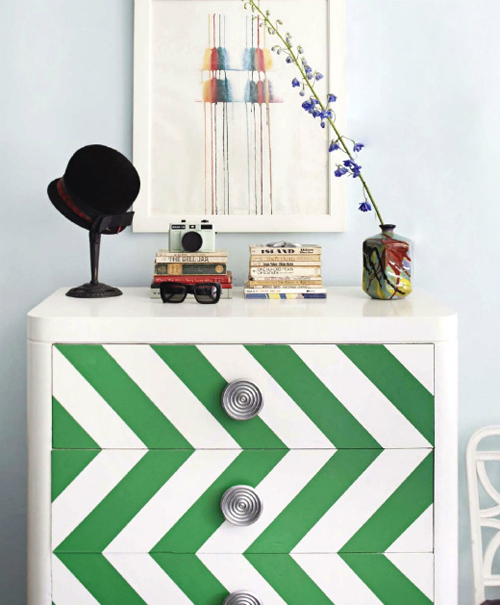 Love that chevron dresser! The use of kelly green looks so fresh! I'm loving the ruffle-trimmed drapes! This is gorgeous, and truly inspiring! I just moved to a studio and have been looking for small-space inspiration. Thanks for sharing! The place is great! Like the flashes of colour - the green zig-zagged stripes and the huge piece of art in the living room, these pics have inspired me to create a New-York style apartment using mydeco's 3D room planner, thanks for the inspiration!